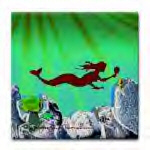 exclusive JustCharmed Mermaid Designs on ceramics, clothing, baby gear and more. This graceful Mermaid on Dolphin Fountain is a work of art. Made of brass and combining the beauty of both bronze and verdi patina this will provide years of lasting beauty. Available in two sizes this fountain is sure to bring lasting beauty to your water feature. Don't forget your pump to complete your newest addition to your landscape. A unique work of art this Mermaid Table Base is nothing less then spectacular. Made of brass with a beautiful bronze patina finish this is a beautiful outdoor table. From her long flowing hair to her sculpted tail fin she is nothing less the spectacular. Base only does not include glass top.